The Hôtel de l'Europe is located opposite the market square in Chamalières, half a mile from the Clermont-Ferrand's historic center and pedestrian area. It boasts 32 spacious rooms, all air-conditionned. This charming hotel provides a warm service, a cosy atmosphere and comfortable amenities, making it the perfect choice, whether you're staying on business or taking a well-earned break. While you are in Chamalières, enjoy a soothing moment in the nearby thermal baths of Royat or indulge in some gambling in the local casino. Decorated in light tones, these rooms have a view of the hotel's terrace or the market square. They also have free Wi-Fi access. You can add an extra bed in this room. Decorated in light tones, this room is Japanese in style. Each one has free Wi-Fi access and views of the terrace or the market square. Set on the fourth floor, this room has free Wi-Fi access and views of the rooftops or the market square. It is decorated in soft colours with a Japanese style. This room has free Wi-Fi access and views of the terrace or the market square. Combining a contemporary and Japanese-style, these rooms are located on the fourth floor. Each one has views of the rooftops or the market square. You can add an extra bed in this room. Decorated in a Louis XV-style, these rooms have views of the hotel's terrace or the market square. There is also free Wi-Fi access in these rooms. 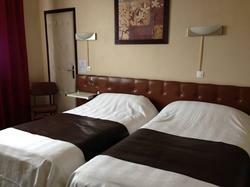 Composed of 1 superior double room and 1 superior twin room.